With the addition of our new Ryobi 525hxx 5 color offset press with aqueous coater, we can handle any full color run up to it's maximum sheet size of 14.5x20.5". 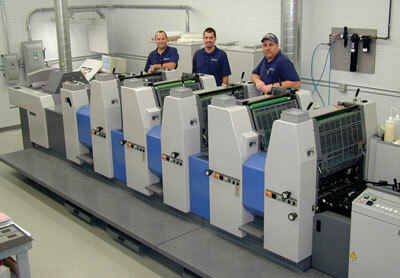 It is equipped with Ink Control Software that automatically adjusts the press for each individual job. It also features Ryobi's PDS system which constantly monitors the color bar on the press sheets and adjusts the ink fountains automatically. With our Computer to Plate system feeding this press, we can produce the highest quality 4 and 5 color jobs with or without coating in a time frame not even dreamed possible a few years ago.